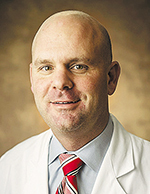 Vanderbilt's Scott Arthur, MD, recently performed the state's first knee surgery using a newly approved implant containing a patient's regrown cartilage cells. Trademarked under the name MACI, the implant was approved by the U.S. Food and Drug Administration in December. It is the first FDA-approved product that regrows knee cartilage cells on scaffolds. Previously, this type of regenerative therapy, which entails extracting healthy cartilage cells from a patient's knee then re-growing them in a laboratory, was available only in liquid form. "In the first generation, called Carticel, you would have to take a patch and sew it into the cartilage and then inject the liquid containing the cartilage cells behind the patch," said Arthur, assistant professor of Clinical Orthopaedic Surgery and Rehabilitation. "With MACI, the M stands for matrix so it is a collagen matrix, and the patient's own cartilage cells are implanted into the matrix. In the operating room, we shape the patch to fit into the cartilage defect." "It's a good option for some joints with really difficult problems," Arthur said. "A lot of patients who would benefit from MACI tend to be younger patients, athletic patients who want to regain a high level of function." "This is the next frontier in orthopaedics -- trying to figure out ways to use your body's own ability to repair itself," Arthur said. "The future is utilizing stem cells and growth factors and cell therapy to encourage and enhance healing and recovery. That's where we are going. We are in the infancy of trying to figure a lot of this out."